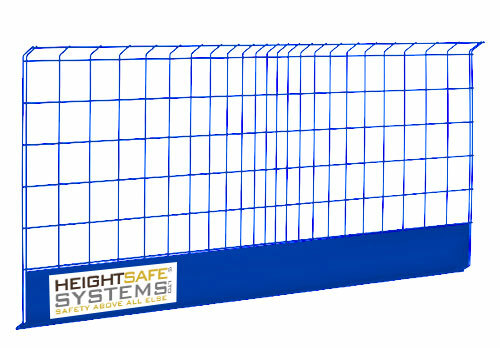 The Heightsafe Barrier is lightweight and extremely robust. Every welding point withstands a load of up to 500 kg. With its weight per unit of less than 20 kg it is a versatile, efficient mountable system with an excellent product quality due to state-of-the-art production methods. It is adjustable in height and offers protection by its double edges. A wide range of attachments can be delivered to allow for installation on most surfaces. Available in a range of sizes please contact us for more information or for a quotation. Available to hire or buy, we also offer our experienced teams of site staff to provide an erect and dismantle service for your projects anywhere in the UK. If you are an existing user of a similar system we can also provide our teams on a labour only basis for your projects should you require it. Additionally our product is compatible with a number of other systems on the market so if you are a little short….please give us a call and we may be able to help you complete the job.